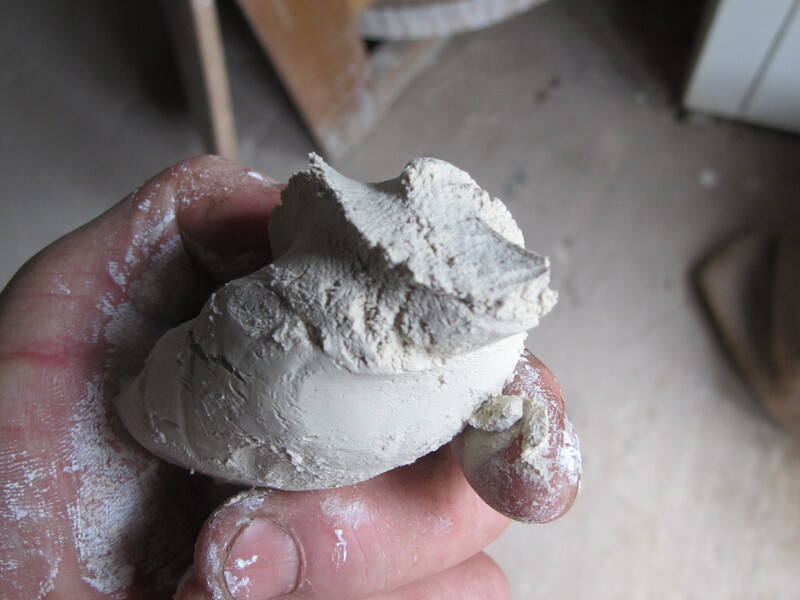 My new batch of native bai tunze porcelain stone clay body is ready – if you can call wet rock dust a ‘clay’? Whatever it is, it’s all lifted from the drying bed and stored in plastic bags waiting for pugging. I have been up in Sydney all of last week teaching a MasterClass in porcelain bowl making. I took along a couple of samples of my homemade porcelain bodies for my students to try. I got to throw this batch for the first time during this week. It was lifted on Sunday and thrown on Wednesday. Not a long time for ageing, but it was surprisingly good for something so fresh. It had quite a bit of stretch to it for milled stone but showed its true character by tearing with lots of stretch marks and little cracks as it was pushed to extremes. On the potters wheel it held up reasonably well for something so thixotropic. I had found that I needed to dry it out a little more before throwing because of the thixotropy effect of the kneading. This kind of milled stone body with lots of alkali present has very low plasticity and a very narrow range of Atterburg limits. This means that it goes from being too wet to hold its self up properly, to so dry that it becomes crumbly in a very short space of time, so drying is critical. I have learnt to keep it on the soft side until I need to use it and then stiffen it up to the desired consistency just before throwing. Conventional potters kneading doesn’t always give the desired result with this kind of paste. In fact, it doesn’t knead well at all. 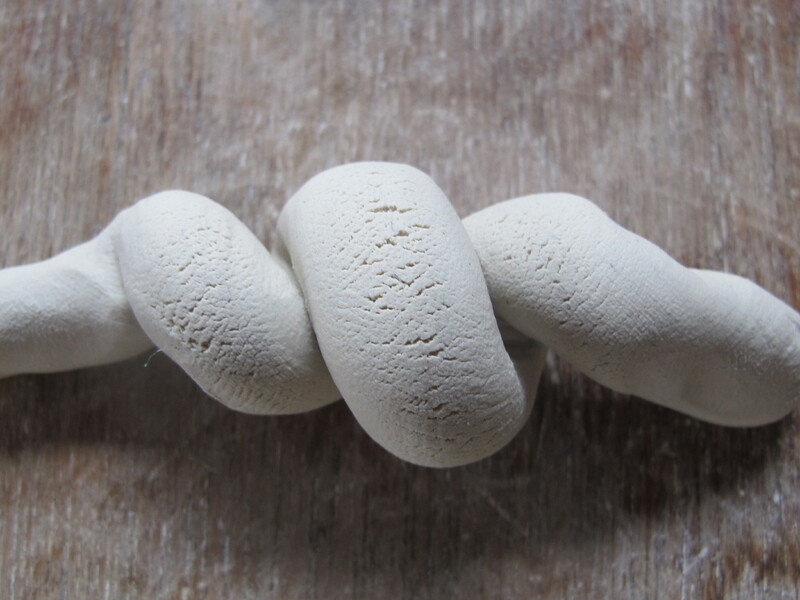 I learnt to wedge and knead clay in the traditional Japanese spiral fashion a long time ago when I did my apprenticeship with a Japanese potter. I became quite proficient at it. I had to. He was very demanding. As it’s turned out, this is one of the two things in life that I can do well, so I’m not embarrassed about my spiral kneading/wedging skills, in fact I considered myself competent. So when a new teacher came to the National Art School in the early/mid seventies to teach there and we shared a class together. I got to learn something new. Gillian Grigg was very well trained in Stoke on Trent and later, topped off with a Masters degree from the Royal College of Art in London. She was a gifted artist and potter with an amazing range of excellent skills. Everybody was in awe of her capabilities, while she was was quietly diffident and understated. It transpired that one day we were sharing a class and the subject of porcelain came up. I mentioned that it was hard to knead, but could be done well with some practice and proceeded to demonstrate what I had learnt. Gillian watched and then quietly mentioned that she had been taught in Stoke that the technique of cutting and slapping the clay together, called wedging was proven to be a superior technique to spiral kneading. As this was not what I had learnt, I was surprised to hear this. Gillian assured me that this was what had been demonstrated to her during her studies in Stoke. Gillian spoke quietly, but carried a big stick of knowledge, experience and skills, so I listened, but I was very confident that I had good skills, perhaps too full of hubris and youthful inexperience though? We set about providing an experiment for the class. 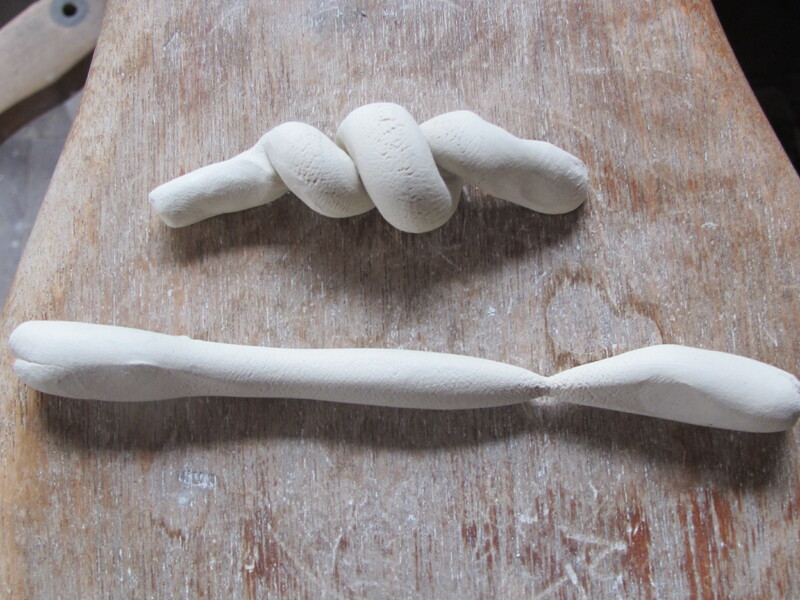 We divided a bag of porcelain clay between us and set about preparing it by our own methods. After 5 minutes of this we cut our block of clay in half and swapped half our clay with each other. We then proceeded to throw a pot out of each ball of clay. I had to admit that Gillian’s clay was noticeably much better than mine. Tighter and more workable. I learnt something that day and it’s stuck with me. Thank you Gillian! We were like chalk and cheese, she so full of fine, natural talent, acquired knowledge and hard won experience, while I was a young ceramic kelpie with too much energy and not enough knowledge or experience. 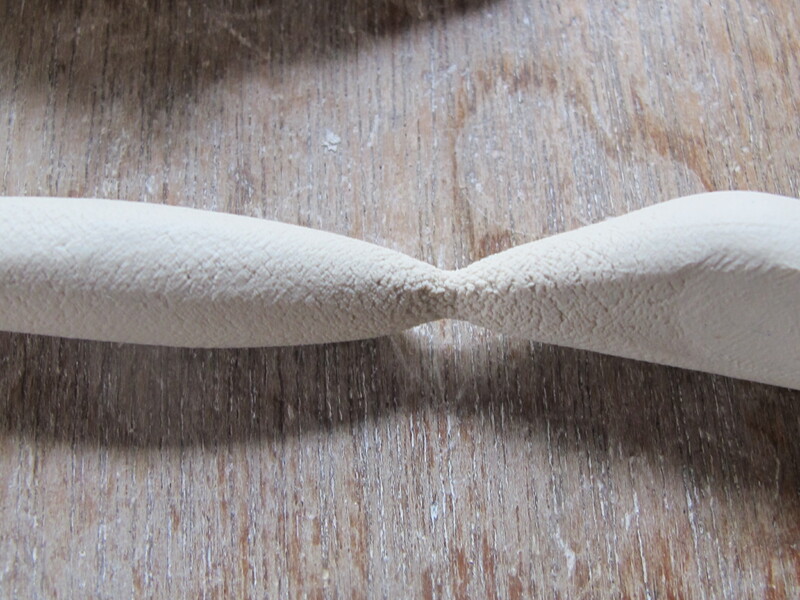 To this day I finish my preparation of these milled rock paste bodies with a session of cut and slap wedging. This new batch of bai tunze is much better for it. It’s a little tricky to get the moisture content just right, but once it is, it throws on the wheel with the plasticity of a soft-ripened cheese – double brie perhaps? After it’s been resting out of the fridge for a while! When I am preparing the minerals for this body, I carefully choose to use the tannin stained black water from the water tank below the pottery that collects the most eucalypt leaves. This water comes from the tank a dark slate grey to black/brown colour like over brewed black tea. I choose this water because the tannin helps to create good plasticity. It reduces the pH of the batch as it is being made and neutralises the alkali that is released from the stone during milling, as the combination of alkalinity and fine non-plastic particles produce thixotropic effects. i.e. it turns into warm brie on the potters wheel. Throwing this clay is an exercise in coaxing a stiff non-plastic paste up into a simple form and leaving it thick at the base to support the rim. It’s not a pretty sight, but if the form is well planned it can be coaxed into something by judicious turning later. When the pot is dried to leather hard it can be turned roughly to reduce weight and create a more even thickness, but this kind of non-clay material just isn’t sufficiently plastic to allow conventional turning. It tears and rips apart into torn chunks like cutting through Tasmanian Mersey Vally cheddar cheese. Very crumbly with no real internal cohesion. Roughing out is all that is possible at this stage. This clay turns from brie to cheddar, then to chalk over time while drying. 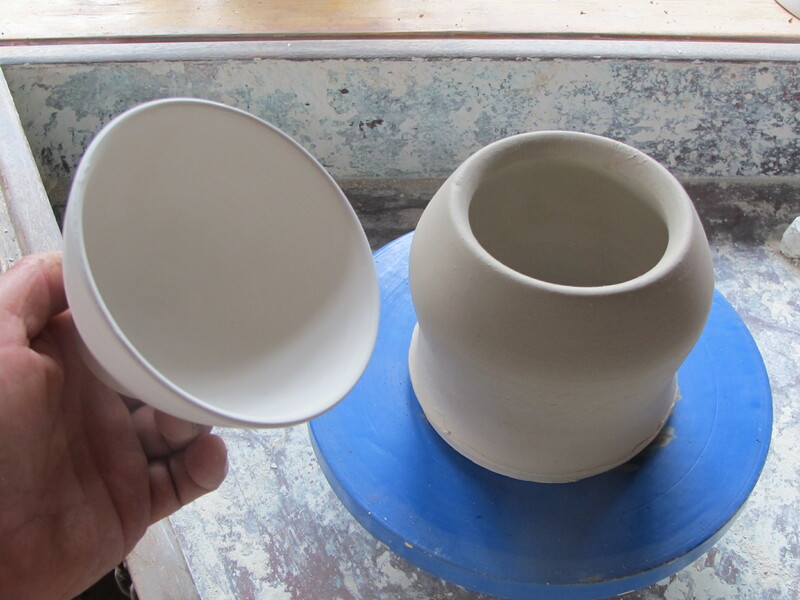 The pot is left to dry to almost bone dry before it can be turned to a smooth, fine, finish. 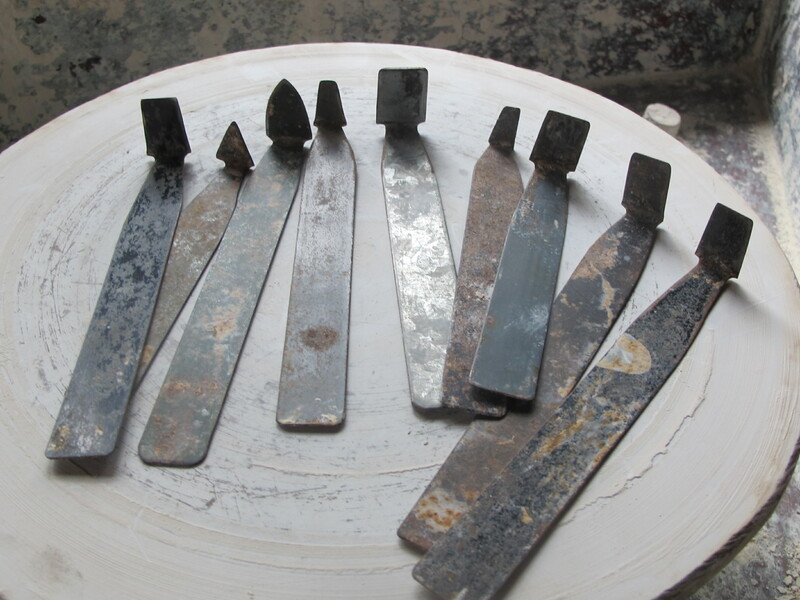 Turning bone dry requires very sharp turning tools that need to be re-sharpened regularly, as the stone fragments wear away the metal and blunten it very quickly. I have seen some potters in Japan using tungsten carbide tipped turning tools that hold an edge very well for a long time and I got to try using one in Tatsuya San’s workshop last year. I bought one after that, but I find it a bit heavy and cumbersome, as I’m used to making my own tools out of high carbon steel, re-cycled, packing case strapping. They are quick and easy to make and easy to keep sharp with a few strokes of a file. I like that they are so light and flexible. I guess that it’s just what you get used too. Perhaps I like them because I can make them myself from re-cycled material, forestalling waste and re-purposing industrial discards. It is one small part that adds to the bigger picture of self reliance. Turning pots bone dry is just a little tricky also, as you need to use a specially designed leather-hard clay ‘chuck’ to hold the pot perfectly and intimately with exquisite contact detailing, such that the bone dry and very fragile rock dust bowl form won’t crack due to the stress and pressure of the turning and trimming. This process can also be quite dusty as well, so measures have to be taken to minimise the dust. I tend to turn while there is still just a small fraction of moisture still in the pot. In workshops where they turn like this day-in and day-out, they install exhaust fans to collect the dust in a dust extractor where it is collected for recycling. Turning dry clay like this is like cutting through chalk. Actually, it’s more like grinding away at a chalk surface and reducing it to powder to reveal a form encased or hidden within. I’ve come to like turning, it’s the other thing that I’m OK at. From the Journeyman on the remarkable journey from Cheese to Chalk and then on to the Pig’s Ear. (porcellana). Porcelain was named for its similarity the Italian sea shell (cowrie shell), ‘porcellana’. Named for its pale white, translucent quality. However, the shell porcellana was named for it’s similarity to the pale white translucent nature of a pigs ear. Hence Porca – lain. I wonder if I can make a ceramic purse out of it? Best wishes from the potter with the cheesy grin, who’s bringing home the bacon. 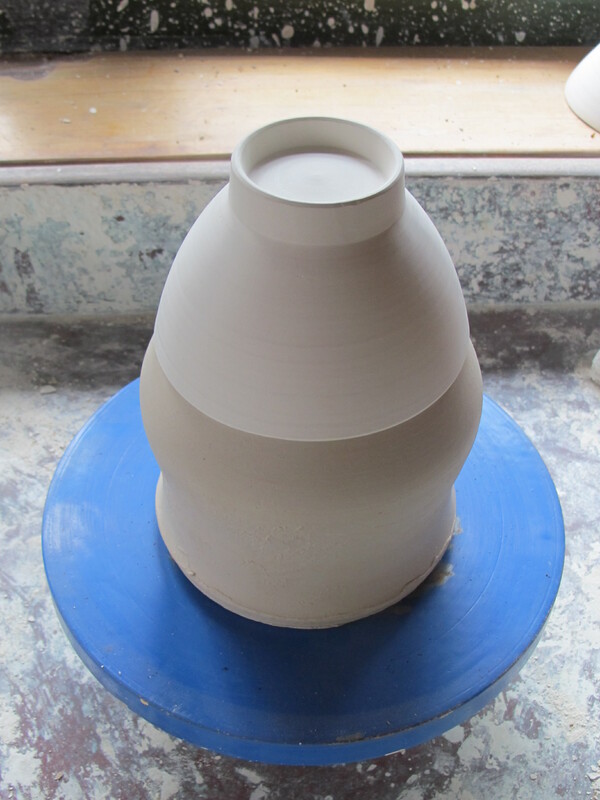 This entry was posted in In the pottery, self-reliance and tagged Gillian Grigg by hotnsticky. Bookmark the permalink.